Very nice two bedroom apartment with a wonderful panoramic view of Plage du Midi, the Mediterranean Sea and the Esterel Mountains. It's not hard to understand that the balcony has always been a favorite place for all guests, for breakfast or for a late dinner or just for relaxing to the sound of waves against the beach. When you enter the apartment, the living room opens with large glass doors leading onto the balcony. The living room has a dining table, sofa with coffee table and TV. Next to the living room there is a fully equipped kitchen with everything you need for both breakfast and dinner. In the first bedroom you have a double bed and large glass door that gives direct access to the balcony. In the second bedroom there are two single beds. The bathroom has a large shower corner and also a washing machine. 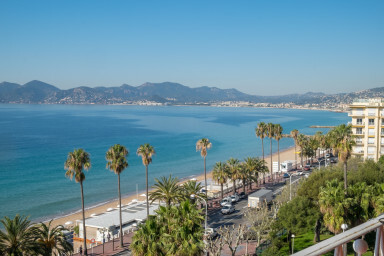 The apartment is located just off the Plages du Midi, a few minutes walk from Le Suquet (the Old Town of Cannes), and less then 10 min walk to the Palais des Festivals, Croisette, and all else that Cannes has to offer. The main entrance to the building is from Rue Georges Clemenceau. A second entrance that takes you directly onto the Plage du Midi where you will find a well-managed public beach and sections of the beach where you can rent a parasol, a mattress, etc. From the beach to the Palais des Festivals and further via the Croisette you will find a large number of restaurants, bars, from budget to very expensive.